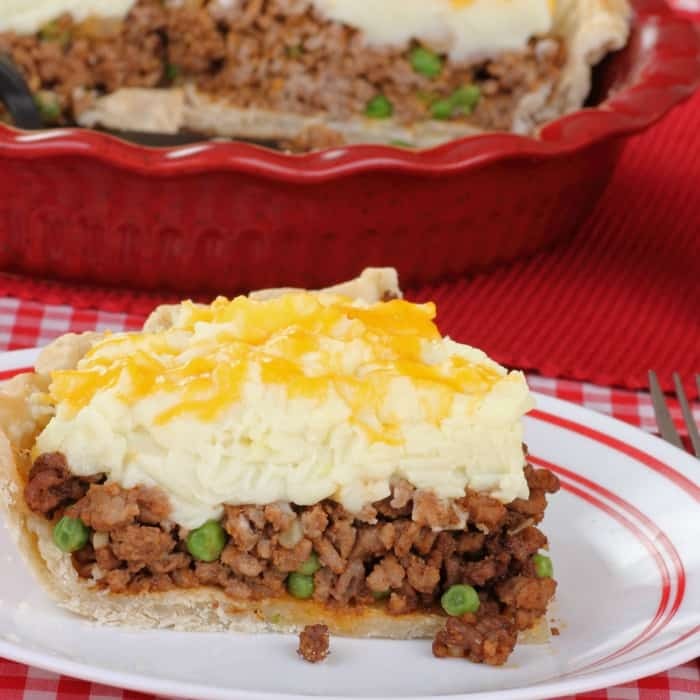 One of my family’s most favorite winter meals is one of my best kept secrets…Easy Shepherds Pie. The recipe itself is fairly uncomplicated and, I’m sure, other families probably do it the same way, but the big secret for my family? How quickly it comes together. I mean, I make the mashed potatoes in a big batch on the weekends, then freeze them. 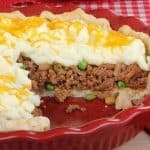 When I want this easy Shepherds Pie, I just pop the mashed potatoes in the microwave while the crust is baking and the meat is cooking and then toss it all together. It’s like a symphony of yummy happening right there in my kitchen. Heh. I made this the other night for just me and the hubby after work. And, of course, we couldn’t eat all that, so we popped it in the refrigerator and I took some to work for lunch the next day. I’d forgotten how RIDICULOUSLY good this recipe is as a day-after-meal. I mean, it’s like lasagna…just gets better with age. And sometimes, I like to let the Shepherds Pie sit in the oven for just a few minutes “too long” to make the mashed potatoes brown a little…So, if you’re into that, this recipe is the one for you. LOL! 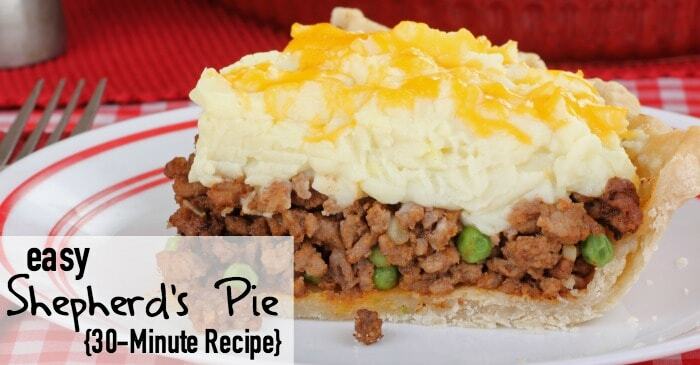 One of my family's most favorite winter meals is one of my best kept secrets...Easy Shepherds Pie. The recipe itself is fairly uncomplicated and, I'm sure, other families probably do it the same way, but the big secret for my family? How quickly it comes together. Place ground beef, chopped onion, minced garlic, celery seed, salt and pepper in a medium-sized skillet over medium heat. Stir occasionally and break hamburger into small pieces as it cooks. 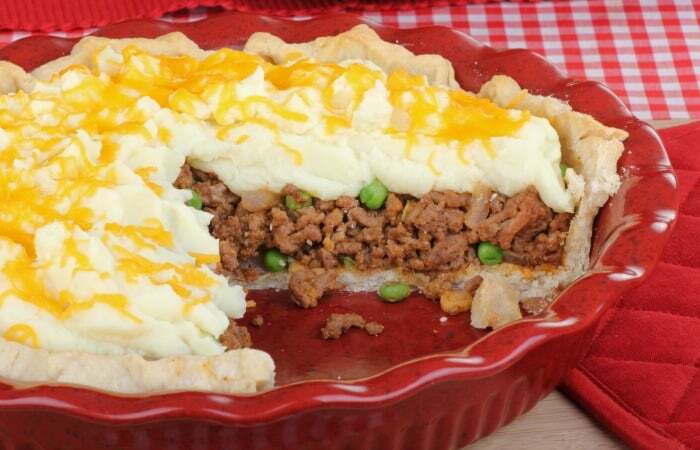 While the ground beef is cooking, place the pie crust in a pie pan. Using a fork, prick the bottom of the crust. Trim and crimp the edges. Place the pie crust in the preheated oven and bake for approximately 10 minutes, or until the edges are golden brown. Continue cooking the ground beef until it is browned, then remove to a bowl lined with paper towels. Open the can of English Peas and drain off and discard the liquids. Place the peas in a small bowl and heat in the microwave for 2 minutes. Remove and discard the paper toweling from underneath the browned hamburger meat. Add the drained and heated sweet peas to the hamburger and stir to combine. Spoon the combined hamburger and peas into the cooked pie shell. Spread the mashed potatoes over the hamburger and pea mixture. Place in preheated oven for approximately 10 minutes, or until the cheese is slightly melted. Let me know how your Easy Shepherds Pie turns out. I’d love to hear from you in the comments or on Facebook. And, don’t forget to sign-up for our Newsletter!